Against the scenic backdrop of the rugged, unspoiled Cretan countryside with the olive groves and the imposing Lefka Ori mountain range dominating the horizon, Kalithea Villa stands like a crown. Kalithea Villa is a beautiful and particularly thoughtful property with a private swimming pool located at the foot of the White Mountains (‘Lefka Ori’) of Chania in Pemonia, a cozy little village at the Apokoronas region of Crete. With a stunning view to ‘die for’, comfortable and stylish amenities and a five star privacy, Kalithea Villa is a fabulous retreat where you can truly escape from the stresses and strains of our modern life. The interior of Kalithea Villa is furnished to a very high standard and can definitely satisfy even the most demanding Guest. The exterior of the villa has numerous spots from where you can enjoy the magnificent view, with the poolside being probably the most privileged part of Kalithea. 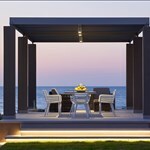 This magnificent Cretan villa has been developed in two levels and a total of 200 square meters interior space. Kalithea can comfortably accommodate 6 Guests and consists of 3 bedrooms – each with its own en suite bathroom, 1 toilet and an open space kitchen, living and dining room area. Driven by the respect for the environment, Villa Kalithea has been constructed and since then operating under the maximum discretion to its natural surroundings and the local architecture. Even the very plot of the villa was selected after a careful study on energy efficiency and heating and cooling optimization with solar energy used wherever it is possible. The main building of the villa is an amalgamation of two worlds characterized by simple lines and derived by blending harmonically the Cycladic architecture elements with the distinctive traditional architecture of Crete. The materials that were used in the construction were selected carefully; local stones, unprocessed wood, ochre and ecological paints, were brought together with traditional construction techniques. Some people’s idea of the perfect vacation is spending time in an area that has retained its natural beauty and is unspoiled by tourism. This is exactly what you will find at the village of Pemonia where you can enjoy a stay in Kalithea, a villa with a private pool in Crete. This is a village close to the coast at the base of the rugged White Mountains (Lefka Ori) in the Apokoronas area of Chania. The area is famed for its natural beauty and diverse landscape. The combination of stunning beaches and beautiful mountains is the perfect setting for visitors looking for an alternative or ecotourism experience on their vacation away from the hustle and bustle of mass tourism. 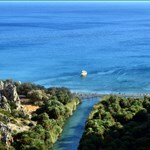 Located just 28 kilometers from the city of Chania, Pemonia is also within easy travelling distance of Rethymno (36 km). This village is also the perfect spot for a winter vacation as you can take advantage of the pretty beaches in Almyrida and Kalyves during the warm days of the mild Cretan winter. If you are visiting the area in the summer months, the endless beach of Georgioupolis which stretches for over 10km is a fantastic place to relax and enjoy the wonderful climate of Crete. If you do not want to spend all your time in villa Kalithea, then there are amenities and some great places to eat in the local villages and these are within close proximity. For basic supplies, you will find everything you need in Pemonia. However, if you need more supplies, then you will need to drive to Kalyves or Vrysses. Kalyves is ten kilometres from the villa and Vrysses is eight kilometres away. On the days when you want to eat, you will find traditional Cretan taverns in many of the local villages. 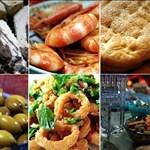 These serve fantastic Cretan dishes that are freshly prepared using seasonal local ingredients. For some of the best local cuisine, you might like to visit the villages of Agioi Pantes, Tzitzifes or Melidoni. All these villages are less than two kilometres from villa Kalithea. If you are willing to travel a little further, then there are some great restaurants and taverns in the seaside villages. These include Almyrida, Armeni, Georgioupolis and Kalyves. For anyone who wants to enjoy a vacation in a private villa with a pool in Crete, the Villa Kallithea is a wonderful place to spend time. Not only is the accommodation of a high standard, the surroundings are picturesque and this is the perfect location for a quiet and relaxing vacation. On the edge of the Pemonia village is a private road and this leads to the Villa Kallithea. This beautiful villa in Crete is situated in a remote spot and boasts panoramic views of the surrounding area. It is perfect for anyone looking for a private villa with a pool in Crete who wants to stay in an undisturbed location away from prying eyes. The villa can accommodate six people with the option of two additional Guests in extra beds and sofas. The ground floor of the villa has an open-plan living room and kitchen that provides both comfortable seating and all the appliances you need. This room also includes a dining area if you prefer to dine in the villa rather tan eat out. Also on the ground floor, there is one bedroom with an en-suite bathroom and a separate WC. The outdoor space includes a veranda and an outdoor dining area if you prefer to eat your meals in the sunshine. On the first floor of this villa in Crete that is reached by a stone staircase, there are two more bedrooms each with an en-suite bathroom. There is an auxiliary room and a corridor that leads to a patio and second outdoor seating area. Additional Guests: The villa can accommodate comfortably up to 6 Guests and 2 additional Guests who can sleep in sofas and extra beds. Please contact us for additional Guests as prior arrangement is necessary.